So if she started to have contractions during the "Commonwealth Meetings" (in abbreviation) William couldn't go with her to the hospital? (he had some engagements during these days. On April 18 Omid Scobie tweeted "Just five days to go until the #RoyalBaby is due!" And from what this Omid Scobie would know the due date? The Royal watchers have been saying the 23rd for awhile now...but I have no idea why exactly. Would be a great birthday present for the queen if the baby would be born tomorrow. My guess is a boy which is funny, because I always thought it will be a girl. But I get a boy-feeling more and more these last few days. Prejudice is opinion without judgement. I'm a firm supporter of fair chance's. Use your chance, Sofia. You're doing a fine job so far. They did the same with George and decided July 11th was the date. Obviously they then panicked and thought this was a decoy date and started to camp in front of the hospital way too early , driving themselves and everyone else crazy. I think they just don't want to say that they have as much information as we have . Same here (though different timeline). It seems to me it will be a boy. Unless she's a serious tom-boy! The baby willl probably be born this week, so I guess it won’t get to May. I really don’t think she looks that much bigger than the first two pregnancies, keeping in mind we don’t know when exactly her due date is. She could be at 36 weeks or even more. So the photo when she was expecting George was taken June 15 and George was born July 22. Yes, and with Charlotte her last engagement was March 27th and she was born May 2nd. Both George and Charlotte were late. The Duchess of Cambridge is undertaking her last public engagements today before going off on maternity leave, Kensington Palace says. 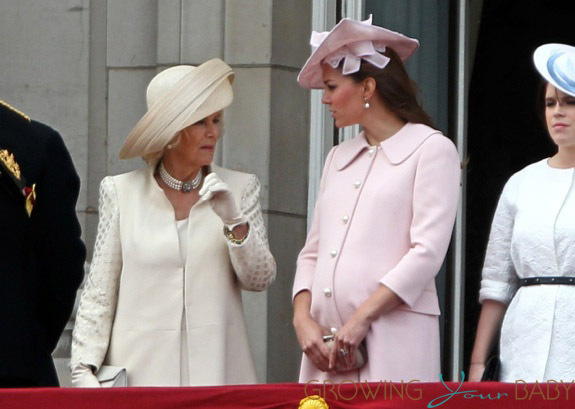 That means that the Duchess of Cambridge undertook her last engagements 5 weeks and 2 days (June 15, 2013) before the birth of George (July 22, 2013) and 5 weeks and 1 day (March 27, 2015) before the birth of Charlotte (May 2, 2015). Since her last engagement with this pregnancy was March 22, 2018, the child should be born on April 27 or 28 if the birth is as "late" as the previous two. i guess charlotte and the new baby will have birthdays very close to one another, and then george's birthday wouldn't be far off either! great timing - all spring/summer birthdays! Probably the same source that said she was having a home birth. Keep throwing muck at the wall and hope something sticks. True. I very much doubt she will be a big presence at the receptions, and she may skip the evening party altogether -like the older royals. Zara might do the same depending on the her due date, and how comfortable she's feeling. If Catherine does have some unexpected birthing/post-partum complications and has to miss the entire wedding, then whilst it is unfortunate I don't think it would bother the bride or groom all that much. In choosing the date they knowingly assumed all the off-chance risks involved. And frankly they were likely much more concerned in picking a date that guaranteed the presence of their parents, grandparents, and best friends. Those are their tier-one people. Catherine is merely Harry's sister-in-law, not their blood, and not their close friend. She was never going to take top priority in their wedding plans. I agree with your whole post. Hypocritically speaking if (God forbid!) The Queen or Prince Philip passes away by October would Eugnie Wedding be delayed by a few months or even a year? But back to the original discussion at hand the Duchess is a very healthy Women and had carried ( and birthed) 2 pregnancies without any complications. If she gives birth this week I sure she would be well enough in 3 weeks time to attend Harry and Meghan wedding. she is very close to Harry and I can see her doing everything in her power to attend his wedding. The only way I see her missing it is if she is strongly advised by her Doctor to rest. Harry and Meghan and The Royal Family knew there was a risk and I am sure they talk about it before making the final decision. I don't think Prince Harry would have picked the date if it didn't bother him that there was a possibility that the Duchess of Cambridge may not make it and of course the Queen has to give her final approval. Long Live the Queen!! The Real Queen of Hearts! Does anyone know when was Catherine's first appearance after the birth of George and Charlotte? Maybe this time it will be the quickest we will see her after giving birth, less than a month now until Harry's wedding. I'm sure she will try her best to attend the wedding unless her health or the baby's isn't the best. Baby 3#, please come to the world to meet your parents and siblings, and of course, the media! Does anyone know when was Catherine's first appearance after the birth of George and Charlotte? Maybe this time it will be the quickest we will see her after giving birth, less than a month now until Harry's wedding. She had an engagement 5 weeks after George was born in Wales. For Charlotte, I think trooping the colour was her first real appearance post-birth, so that would of been about 5 weeks. So 5 weeks is her general return time. Didn’t they say Charlotte was due in April and she didn’t arrive until May? I think this week baby Cambridge #3 will grace us with his/her presence! I think this week too!